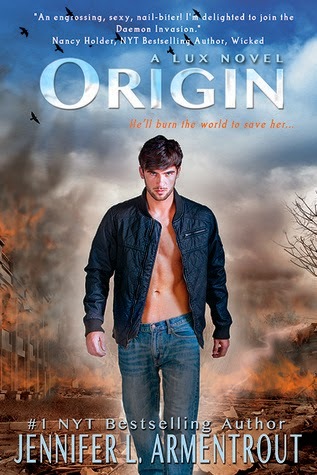 I have to say that Origin is definitely my second favorite book in this series, with number one being Obsidian. There was just so much packed into this book! The first thing that I loved was how much we learned. We learned so much more about the Luxen, Arum, and Daedalus. It really shed a whole new, and bigger, light on everything that is going on in Katy and Daemon's world. The second thing I loved was how action packed this book is. Every page is filled with more and more action and it really never slows down. I absolutely loved being on the edge of my seat from page one. Everything was so unpredictable and I honestly had no idea where the story was going or what was going to happen next (except what happened with Dawson and Beth. I saw that coming a mile away). And the betrayal that happens in this story, ugh it's great in such a bad, bad way. But that is all I will say on that! The alternating point's of view from Katy and Daemon were such a great addition to the story as well. I want to say that Jennifer should have been writing them this way from book one, but on the other hand I don't think we would have gotten as much enjoyment out of it in the beginning as we do now. In the beginning you kind of needed that mystery of never knowing what Daemon was thinking so that you could really relate and get in the head of Katy, but now you need to know EVERYTHING. I read this in 3 days, which is actually very slow for me in terms of this series. I read all the other ones in a day, but I have been very busy. I am glad, though, that I broke it up, because in just 3 short days the last book in the series, Opposition, will be out and the series will be over. The ending was completely RIDICULOUS in the sense that I cannot believe what happened. All I could do was repeat over and over again "What!" and "omg!" I even tried to explain to my mom what just happened to me, but she just didn't get it and looked at me like I was insane. This is definitely my second favorite book in the Lux series, with Obsidian being my first. I absolutely loved how fast paced it was and that I could honestly not guess what was going to happen next. So many bad things happen to Katy and I could definitely feel for the poor girl. The alternating points of view from Katy and Daemon were excellent and definitely something that helped this book a lot. I am so happy we finally get to know what is in that sext alien's head. The ending was absolutely ridiculous since it is such a HUGE cliffhanger and I have no idea how the last book is going to wrap everything up. I will definitely be reading the last installment the day it gets here in the mail.